The cost of obesity for American men has been given a monetary figure and it ain’t pretty reading. 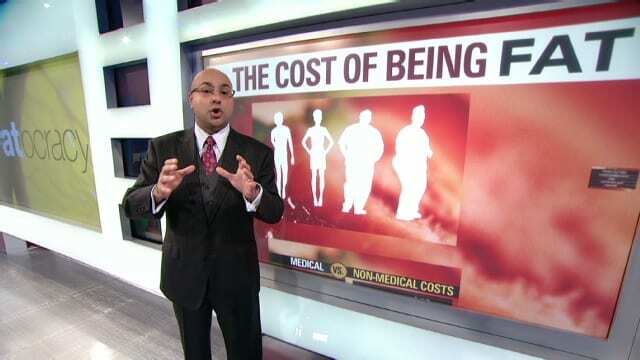 If you are classed as obese you will spend as much as $2600 per year for the privilege. If you’re an obese woman it’s even worse – $4900 per year! A person is classed as obese if they have a Body Mass Index of 30 or higher. BMI is calculated by your height and weight. A BMI anywhere between 25 and 29 and you are classed as overweight. A BMI between 19 and 24.9 is what you should be aiming for and is classed as normal. The extra cost of living for being ‘just’ an overweight man instead of obese is $432 per year and for women it’s $524 when compared to someone who is considered the correct weight for their height. To calculate your own BMI divide your weight (in lbs) by your height in inches. Divide the result by your height again and then multiply that answer by 703 and round up to the nearest decimal place. The cost was calculated by the George Washington University and they say the higher cost of living relates to things like the extra gas your car buses carrying the added load, medical expenses caused by weight related problems and even loss of wages due to obese and overweight men taking more time off work. With obesity in America at an all time high these extra costs soon add up. According to a local news report in Alabama from CBS42, obesity costs their state a staggering $1.3 billion every year and that’s just one state! In their report a director from the Alabama department of public health complains most people in the state don’t believe her department should be telling them what and how much they should be eating. The video above is from a CNN report covering the George Washington University findings. Of course the real cost to you is the dramatic shortening of your life so don’t leave it until it’s too late – do something about it now. If you found this report was interesting please consider spreading the word by hitting one or more of the 3 buttons below, thanks.